Leather trench coat $8,738, Valentino. Leather knickers, $180, to order, Obscure Couture. Ankle boots, to order. Proenza Schouler. Quilted leather Jacket, $2,700. Leather trousers, $1,493, both Mulberry. 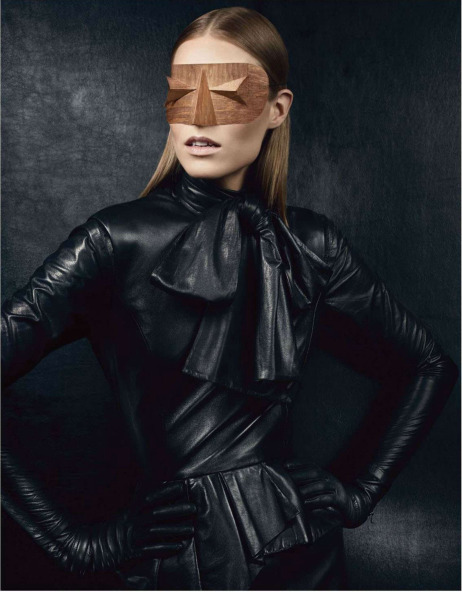 Leather shirt with neck tie, $690, to order, Obscure Couture. Wrist gloves, $338, Yves Saint Laurent. Cropped leather trench coat, from $3,030. Felipe Oliveira Baptista at Avenue32.com. Wrist gloves, $338. Yves Saint Laurent. Leather shoes, $1,455. Azzedine Alaia from a selection at Dover street Market, Harvey Nichols and Matches. Leather jacket, $2,790, Chalayan. Leather trousers, $1,770, Sportmax. Leather gloves, $405, Gucci. Jacket, from $3,675, Givenchy by Riccardo Tisci, from a selection, at Harrods, Harvey Nichols and Selfridges. Calfskin trousers, $7,710, Hermes. Shoes, $671, Celine, at Dover street Market and Selfridges.